Half of the Dorgan children lived in Brooklyn, New York, at 8646 20th Avenue, as recorded in the 1905 New York state census. Dorgan was the youngest, at age 12, and cartoonist Thomas was the head of the household. By 1910, most of the Dorgan family was in Manhattan, New York City at 746 St. Nicholas Avenue. Five years later, the family was in Bayside, Queens, New York on Wright Avenue, as listed in the state census. The same address was found on Dorgan’s World War I draft card which he signed on June 5, 1917. He was a cartoonist with the Matthew Adams Syndicate. The description of him was tall and slender with brown eyes and hair. Dorgan’s New York service card said he served at the naval training camp in Pelham Bay Park, New York, and was a seaman, second class, then a boatswain mate, second class. According to American Newspaper Comics (2012), Dorgan produce Not Now which debuted in the Philadelphia Bulletin on April 18, 1916. The 1920 census, enumerated in January, had Dorgan in his mother’s household in Flushing, New York at 483 Sanford Avenue. Ten months later the Brooklyn Daily Eagle (New York), October 11, 1920, noted Dorgan’s October 9th marriage. Richard W. Dorgan, son of Mrs. Anna Dorgan, and brother of T. A. “Tad” Dorgan, well known cartoonist, of 483 Sanford ave., Flushing, was married Saturday evening to Miss Amelia J. Murray, daughter of Joseph Murray, of Fordham, N.Y., at St. Agnes Roman Catholic Church, 34th st., Manhattan, the Rev. J.A. White officiating. Mrs. John O’Keefe, of Manhattan, was matron-of-honor, and Joseph V. Dorgan was best man. The couple visited Bermuda in April 1921. The passenger list said their address was Fifth Street in Bayside. Four months later, The Daily Star (Long Island City, New York), August 24, 1921, noted the birth of their son at the Hahnman Hospital in Manhattan. Photoplay, July 1922, published Dorgan’s “A Song of Hate” which expressed his hatred of Rudolph Valentino. American Newspaper Comics said Dorgan took over the art chores on Ring Lardner’s You Know Me Al, from Will B. Johnstone, from February 26, 1923 to May 8, 1926. The strip was retitled Kid Dugan beginning May 10, 1926 and ending May 1, 1930. Dorgan also produced Puzzle Picture in 1923. 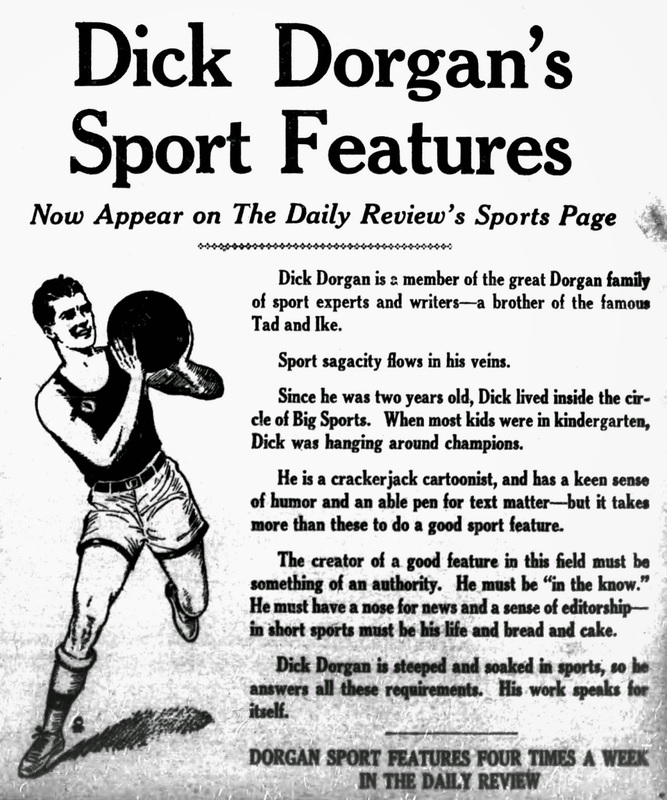 Like his brother, Tad, Dorgan was a sports cartoonist whose subjects included Walter Hagen, Ty Cobb and Dave Danforth. According to the 1925 New York state census, cartoonist Dorgan, his wife, son and a servant resided in Bayside on 222 Street. Tad Dorgan passed away May 2, 1929. A photograph of Dorgan with Tad and Ike is here. In 1930, Dorgan remained in Bayside at 3928 222 Street. 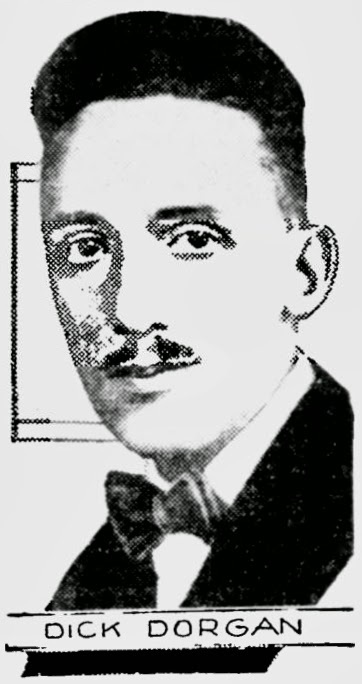 American Newspaper Comics said Colonel Gilfeather was Dorgan’s longest-running series from March 17, 1930 to December 30, 1939. For Syndicated Features, Dorgan created Pop’s Night Out which lasted eight months from July 13, 1936 to March 8, 1937. Pop’s Night Out was reprinted in Best Comics 1, 2, 3 and 4. Dorgan’s address in the 1940 census was 214-32 43rd Avenue in Bayside. The same address was on his World War II draft card, which he signed on April 26, 1942. The description said he was five feet eleven inches tall and weighed 140 pounds. He had brown eyes and hair. The New York Times, March 20, 1950, said his mother passed away March 17. Dorgan passed away May 5, 1953, in Bayside. He was buried in Woodlawn Cemetery in the Bronx.